When I sat down to write this week's list, I realized it was much harder than I thought it would be. The world is packed full of people that I admire. I tend to surround myself with people that I admire in some way or another. That is why I choose my friendships, why I read the things I read, go the the service providers that I go to. 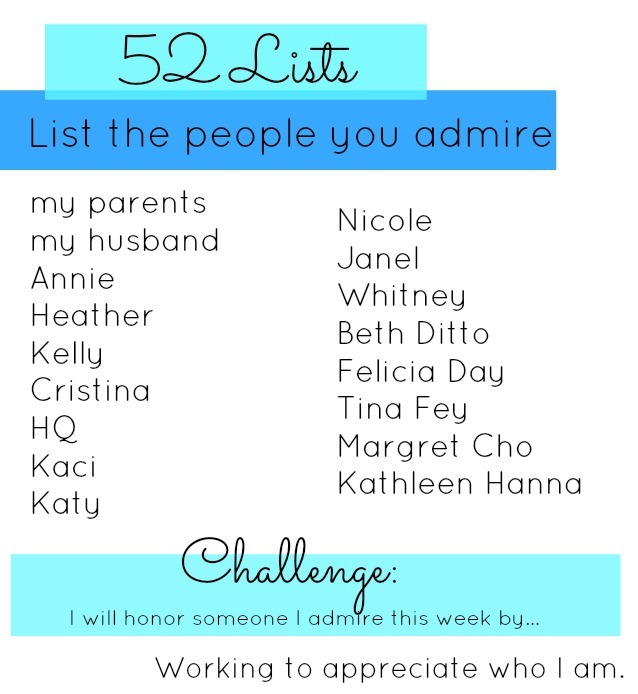 How could I possibly make a quantitative list of people that I admire? The answer kind of is...everyone (Well maybe not everyone, if you are a total jerk, I might not find reason to admire you). I admire anyone who can make their passion a career, anyone who has a skill worth sharing, anyone who lives their life by their own terms, anyone who has struggled and moved past the struggle, anyone who has passion for life - these qualities in people are the things that make me befriend them, hire them, follow their blog, etc. How can I really even try to list all these people? This is a very incomplete list, but here are just a few people I admire. my parents... have struggled a lot in their lives, but they still push on and they have always tried their best & sacrificed to care for my sister & I.
my husband... is the most patient person I know. He is creative and undyingly supportive no matter what and I am lucky to be married to him. Annie... is one of the most courageous & positive people I know. She had a dream of starting a resale store to help make plus sized clothing more accessible and joyful & she has worked her tail off to make that dream a reality. She is also an all around amazing friend. I admire her passion & commitment. Heather... is not only a really great friend who supports me through a lot of dark times and celebrates our friendship with cute thoughtful notecards out of the blue, but she also has dedicated her life to help support children as a youth therapist. Kelly... is the former foster care coordinator at the shelter I volunteer for. She is also one of the most positive and perky people I've ever met...which is extra amazing considering her job centers around baring witness to some heartbreaking instances of animal cruelty. Cristina... is an amazing therapist that has given me so much insight and helped me grow tremendously. HQ... is talented is so many areas from screen printing to film making, and she is always working on amazing projects that inspire me. Kaci... is a total go-getter and is always striving to achieve more in her life. She is also super organized & rational. Katy... has an eye for special things and a wonderful appreciation for nature and adventure. Nicole... has made a life for herself from her art and gets involved in the community to share her passion. Janel... is so wholeheartedly committed to being a mom & she seems to have just absolutely found her true passion in that. Whitney... is a cancer survivor, but she never for a moment let's that hold her back or take away one ounce of her positive, bubbly outlook on life. Beth Ditto... is a total fat fashion icon who has inspired me since the first time I saw her play when I was 18. She is unapologetically fat and absolutely glamorous and talented. Felicia Day... gets paid to live out her nerdy & creative dreams via youtube & makes some really rad content. Tina Fey... is so talented & creative. She has made her living as force to be reckoned with in a male dominated industry. Margret Cho... is hilarious & also lives her life on her own terms with no apologies. Kathleen Hanna... was one of the voices of Riot Grrrl that started a spark inside of me and inspired me to own my femininity, be proud of who I am, and seek out the community of amazing women that changed my life. If we are friends, if I follow your blog, if you are living a life that you want to be living...I probably admire you too. Aw thank you :D This is a really great list. I feel the same way about my husband - like I could have written that. IT's the patience things that gets me about him :D Snd I totally admire Felicia Day too. She's my hero. If I were an actor, I'd want to be as fun and versatile as her. As I'm not, I'll just take it as a lesson to do what I love.